Play-Doh Brings Reading to Life! 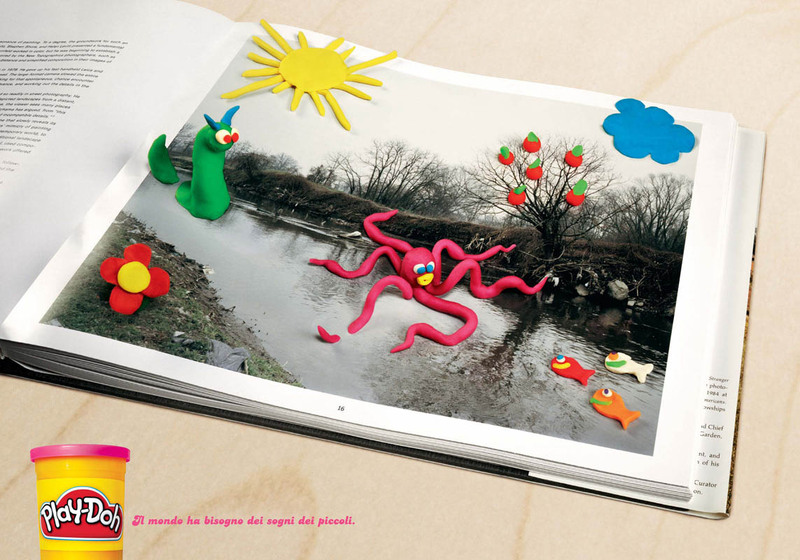 DDB, Milan orchestrated this neat campaign for Play-Doh. The copy reads "The world needs children's dreams." Advertising for Peanuts has more images along the same vein. We happen to like this campaign a lot because we did something similar with our own Play-Doh. The only difference is, we only had the colour green and were later fined by the library for defacing public property. See, that kind of stuff doesn't happen in the sanctioned world of ads. A double page spread for Play-dough in Milan? Big market? It's easy to see that this is a fake. Thanks again for posting scam, Steve. Shows a lot of respect for the real creatives who read your blog. Even if it were, I'm sure "real creatives" (if that actually still means something) have nothing to learn from fakes. CGM much? Let's not put on airs here. WTF is CGM? Another impotent marketing term made-up so somebody can get a fatter paycheck? Airs? No Angela, real creatives have nothing to learn from fakes that are passed off as having actually ran. That's unethical business practice in our industry and the prevalence of it does bother many. Passed off as having actually ran? To start with, the ad's legit. Why don't you share your dignified rage with creative director Vicky Gitto, who was callous enough to develop work that you deem fake. CGM - consumer-generated media. A lot of creatives put out a lot of crap, and what they're finding of late is a great many consumers think they can do better. Sometimes they do. It is narrow and short-sighted to imagine there's nothing to learn from ads deemed illegitimate by industry ilk. Advertising's a conversation. Anybody can join in. When a piece of work is proliferated, when it's discussed, even like this, it's in. And if non-industry members want to show us how to advertise to them, hell, I'd take that as a welcome opportunity to shut up and listen.